“D”-Handle ABS Poly Scoops poly blade is constructed for stiffness and durability. 27″ L handle with large, strong, heavy-duty poly “D”-grip cushioned for maximum comfort. It has a 20″ L x 15.5″ W blade. Size: 14. It is a versatile sturdy garden tool. Great for snow removal, landscaping, and bulk material transfer. Whether you’re a homeowner, farmer, gardener, or horse enthusiast, this tool is designed to make your life easier.This multi-purpose durable tool can be used year round and in all weather. 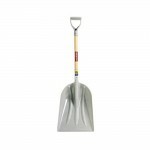 It isdesigned for shoveling or scooping everything from snow to grain to mulch. Metropolitan Wholesale is New Jersey and the New York Tri-State areas one stop source for “D”-Handle ABS Poly Scoops all things garden related at wholesale prices. We carry a full selection of wholesale statuary, fountains, tools, cut flowers, planters and pottery, tropical plants, annuals, perennials, seeds and much more.